What's the most affordable Android phone in town? 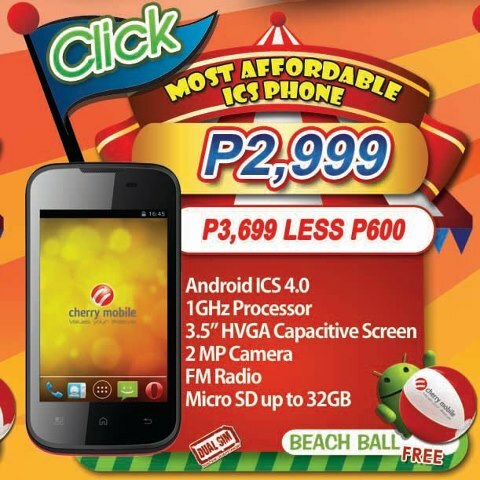 Well, the newly released Cherry Mobile Click may not be the one but it certainly is the the cheapest ICS phone to date. With the price tag of Php 2999, you can get a 1GHz single-core MediaTek processor with dual standby capability. It also throws an acceptable 3.5-inch HVGA capacitive screen, you can't get that same amount of screen real estate in any local brands in a sub Php 3K amount. Other features include a 2MP main camera, FM radio, 512MB of RAM and running the whole show will be the two-year old Android 4.0. Check out the rest of the specs below.